Scratchings have reduced the opposition for Saracino at Sale on Sunday however, the big weight remains. Saracino runs in race seven, the $60,000 Sale Quality where he will be ridden by Brad Rawiller and jump from barrier three with 60kg. The four-year-old was gelded after a disappointing spring and although the form guide reads he only beat one home when resuming in the Listed Kensington Stakes on January 20, trainer Mike Moroney was far from disappointed. “He had no luck and featured in the stewards report,” Moroney said. “He was in a nice spot but then got held up behind Lord Of The Sky when he wanted to get going and then got crowded again inside the final 100m of the race. Saracino is a dual Group II winner and as such, has earned topweight. The son of Per Incanto has pleased Moroney since. 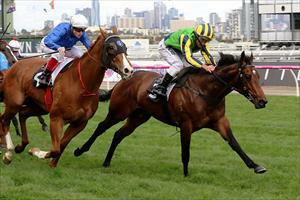 “His work since his last start has been very good and he has definitely improved,” Moroney said.